LIC New Bima Bachat Plan is a participating money back plan where the premium is paid as lump sum amount at the outset of the policy. LIC Bima Bachat Plan 816 was introduced by Life Insurance Corporation of India on 07th January 2014 with UIN Number 512N284V01. It is a Single Premium Plan with many benefits. The Policyholder will get the Financial Protection at the time of Death or Survival Benefit is provided if the Proposer survives for specified duration. On Survival of the Policyholder till the end of the Policy Term, Maturity Benefit along with loyalty addition is provided. The Life Assured can avail the Loan Facility in the case of liquidity need. LIC New Bima Bachat Plan is a Single Premium participating plan. Financial Protection is provided against death of the Insured during the Policy Term. At the end of the Policy Term, an extra Loyalty Addition is provided to the Life Assured. Cooling off period is made available to the Policyholder if he/she is not satisfied with the terms and conditions of the Policy. On Surrendering the Policy, Special Surrender Value and Guaranteed Surrender Value is available to the Proposer. Survival Benefits are provided at specified duration’s during the Policy Term. Minimum Entry Age 15 years. 66 years (for term 9 years). 63 years (for term 12 years). 60 years (for term 15 years). Rs 35,000/- (for 9 years term). Rs 50,000/- (for 12 years term). Rs 70,000/- (for 15 years term). (Sum Assured will be in multiples of Rs 5000/-). Policy Term 9, 12 and 15 years. Survival Benefit: The following benefits are provided on the survival of the Life Assured for the specified duration. For 9 years Policy Term: 15% of Sum Assured will be payable at the end of 3rd and 6th policy year. For Policy Term 12 years: 15% of Sum Assured will be paid at the end of 3rd, 6th and 9th policy year. For 15 years Policy Term: The Life Assured will receive the 15% of Sum Assured at the end of 3rd, 6th, 9th and 12th policy year. Death During First years of Policy: The Nominee will receive the Sum Assured. Death After Completion of Five Policy Years: The Sum Assured along with Loyalty Addition is payable to the Nominee. Maturity Benefit: If the Policyholder survives till the end of the Policy Term, a Single Premium along with Loyalty Addition is provided. Loyalty Addition: Depending on the Corporation experience, the policy shall participate in profits and eligible for Loyalty Additions. During the death of the Proposer after five policy terms or surviving till maturity, Loyalty Addition is provided. The Rebates are provided under this LIC New Bima Bachat Policy. Rebate is nothing but getting discount on tabular premium as per the payment of premium. The Different rates for LIC Bima Bachat Plan is available below. Under Corporation’s Employee Insurance Scheme, the employee is eligible for rebate on tabular premium. The Employee will receive the 2% rebate on the tabular premium. The Customer can buy the LIC Bima Bachat Plan from the LIC Agent or nearest LIC Branch Office. The Proposal form required to buy the policy is available in the official website of Life Insurance Corporation. 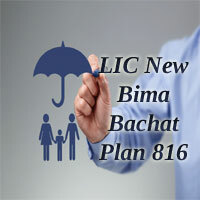 The Documents required for buying the LIC New Bima Bachat Plan 816 are available below. If the Policy Holder is met with sudden accident or disability within the Policy Term or Maturity Period of Policy is completed, the Nominee can lodge the Claim. The Claim Forms can be obtained from Official Website of LIC or from the LIC Regional Offices. During the Claim Process the documents required are listed below. You can calculate the Minimum Premium that has to be Paid to take the Policy By Using the LIC Bima Bachat Premium Calculator. The Amount of Single Premium Paid will depend on the Sum Assured , Policy Term and Age of the Life Assured. You need to enter Some Basic Information like Name, Mail Id, Mobile Number, Age, Policy Term, and Minimum Sum Assured to calculate the Premium Value. Loan Facility: After the completion of one Policy year, Loan facility is available under this plan to the Life Assured. The Amount of Loan given to the Policyholder is equal to the 60% of the Surrender Value as on Date of Sanction of Loan. Assignments/Nominations: At the time of Proposal Stage of the Policy, the nomination is to be made by the Policyholder. The Nominee should be Children, Spouse or close relatives of the Life Assured. Taxes: Taxes including Service Tax and any Other Taxes on Single premium including extra premium shall be Payable by the Policy Holder as per the Tax Laws and the rate of Tax shall be as applicable from time to time. Surrender Value: The LIC New Bima Bachat policy can be Surrendered at any time during the policy period subject to realization of the Premium Cheque. The Guaranteed Surrender Value and Special Surrender Value is payable on surrendering the policy to the Policyholder. Proposal Forms: The Life Assured have to use the Proposal Form no. 300 or 340 will be useful for this Plan. Is any Riders available Under this Policy? Ans: No Riders are available under LIC New Bima Bachat Policy. 2. Is Reinsurance Facility available under this Plan? Ans: Yes, You can Reinsure the LIC New Bima Bachat Policy by using the Normal Procedure. 4. What is Cooling-off Period for the LIC Bima Bachat Policy? Ans: You have the Cooling-off Period of 15 Days to return the Bima Bachat Policy if you are not satisfied with the Terms and Conditions.